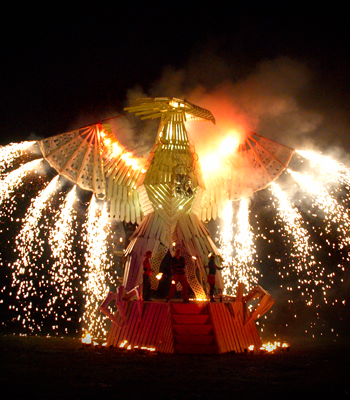 Fire sculptures create images in burning flame. They can make a tremendous impact, and are a subtle and organic effect lasting several minutes. Price is according to size and complexity from £800. Yellow flame is the simplest and cheapest, but blue and green are also effective. They take about a minute to ignite fully. Another technique is lancework, which uses lots of individual coloured fire lances, and is particularly good for lettering.